In the years that followed the Great Recession, the number of undocumented workers joining America's workforce came to a standstill. According to a report from the Pew Research Center, an estimated 8 million undocumented immigrants were either working or looking for work in the U.S. in 2014, from the 8.1 million that were in the U.S. workforce in 2009. Overall, this group made up about 5% of the U.S. workforce in 2014, Pew reported. The flagging growth in the number of undocumented workers is a sharp contrast to the decade prior to the recession. Between 1995 and 2005, the number of undocumented immigrants in the U.S. workforce more than doubled from 3.6 million to 7.3 million, Pew reported. Mexico is a big part of the recent slowdown, said Mark Hugo Lopez, Pew's director of Hispanic research. "Not only is it harder to cross the border into the United States from Mexico, it's harder to cross into Mexico from Central America," he said. Mexico's stable economy has also helped stem the flow of undocumented immigrants coming into the U.S.
"Mexico hasn't experienced an economic crisis recently," Lopez said. "And now there's a growing number of Mexicans who feel like life in the U.S. isn't that much better than life in Mexico." Even though undocumented workers represent just fraction of the overall U.S. workforce, there are industries where they figure prominently. In the agricultural and construction industries, for example, undocumented workers represent 17% and 13% of the labor force respectively, Pew reported. 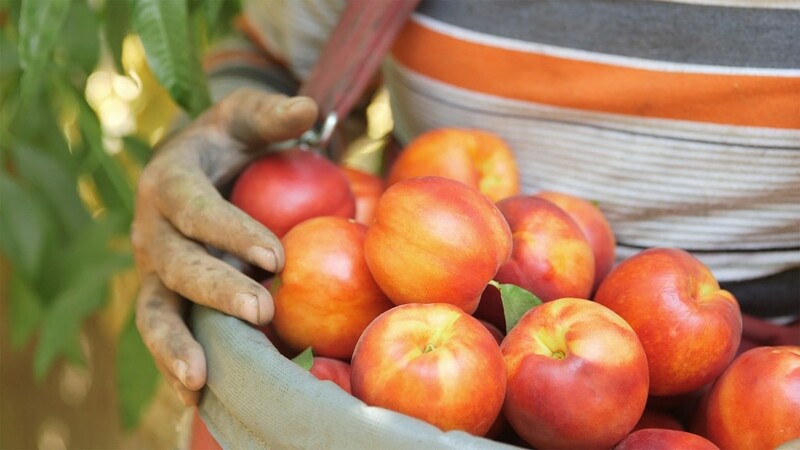 As fewer migrant workers come into the country, specialty fruit and vegetable producers say they're experiencing a worker shortage that has forced them to pay higher wages. With a national average wage of roughly $12 an hour, most American workers don't want to do the work for that pay, industry sources said. Pew also found that seven U.S. states saw their undocumented worker population increase significantly since 2009, while eight other states saw substantial declines. 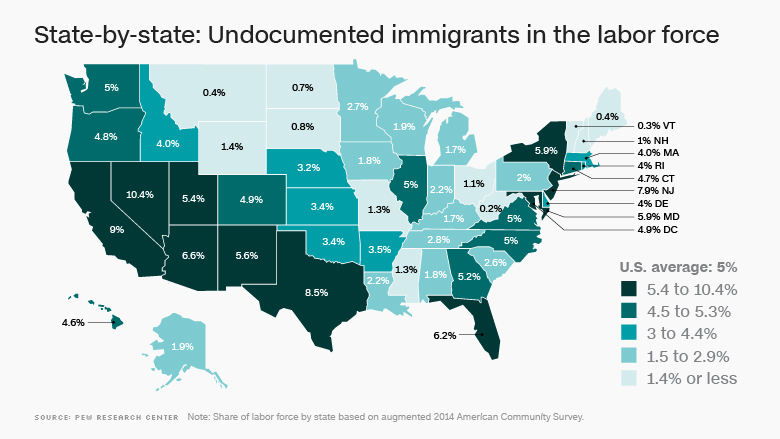 The state with the highest proportion of undocumented workers is Nevada, where the leisure/hospitality and construction industries employ many undocumented workers. 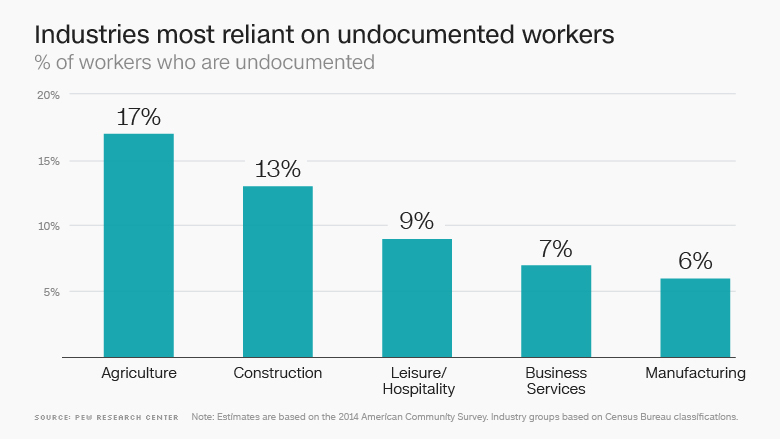 There, 10% of workers were undocumented in 2014. California and Texas follow, with 9% and 8.5%, respectively. The undocumented worker population trend reflects that of the overall undocumented population, which has also held steady at 11 million since 2009, according to Pew. Lopez noted that documented new-immigrant arrivals from Asia, mainly from China and India, outpaced undocumented and documented arrivals from Latin America. The increase in the number of foreign born people could be from an increase in refugees, family reunifications and H-1B visa holders, he said. Some undocumented immigrants start out as documented but become undocumented when they overstay their visas, he added. Using data primarily from the U.S. Census Bureau's American Community Survey for 2005 to 2014, Pew derived estimates for the undocumented immigrant population by subtracting the foreign-born population that are "documented" from the total foreign-born population. It then adjusted its figures to consider people that were omitted from the survey. Pew defined the labor force as those who are 16 or older and are currently working or who are looking for work.